(Boston, MA) When the upwardly mobile Lucy and Rex Taylor (Nikkole Salter and Victor Williams, respectively) are unable to buy a house in Boston because they’re black, they turn to Patty Ann and Joe Donovan (Marianna Bassham and McCaleb Burnett) to buy one for them during the 1950’s. The complex relationship this creates between them bleeds over into the early 2000’s when the Harrisons’ grandchildren discover the elderly Donovans want the house back. The drama that results is tight and enjoyable. Melia Bensussen directs The Luck of the Irish, a production meant to show race and class conflict in New England. What’s truly impressive about the show, however, are how the past and present are blended seamlessly into one beautiful set, designed by James Noone, an enormous house with a long, gauzy curtain billowing out of it. Lucy Taylor shares the stage with her adult granddaughters, the paranoid but funny Hannah Davis (Francesca Choy-Kee) and the spectacular Shalita Grant as Nessa Charles. The actors wander in front and around each other, trapped in their own eras but unable to realize how intertwined they are. The house is a lovely centerpiece to their story. During the first act, almost every conversation that plays out on stage is kept within the confines of each family. Hannah’s marriage to her husband, the hilarious Curtis McClarin as Rich, is compared to the strained but loving relationship of the Taylors, both weary of moving to a neighborhood that may not want them. Nikkole Salter as Lucy Taylor is enthralling in a prim but steeled performance. 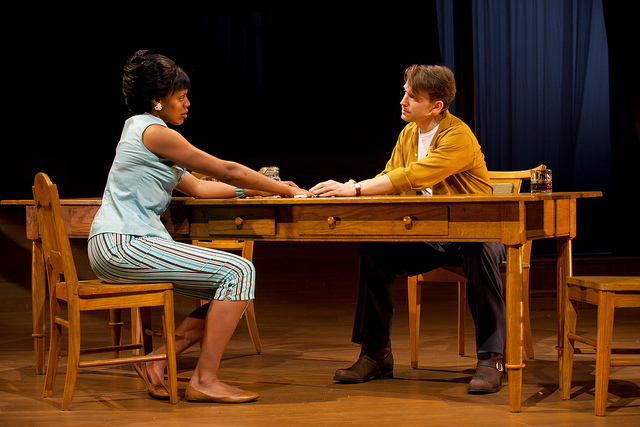 Her contact with the unusual young Joe Donovan (McCaleb Burnett) at the beginning of the second act marks each family’s hesitant foray into more intimate and difficult territory with one another. The Donovans, a white Irish American family trying to dig themselves out of debt, are revealed to have their own troubles. Bassham’s Patty Ann Donovan is Lucy’s foil, another strong woman trying to struggle her way to a better life. The family is never quite as sympathetic as the principal characters, however, though playwright Kirsten Greenidge is fair in her depiction of their lives. If the play has any faults, it’s that the ending of Luck of the Irish feels convenient. Watching the tension build between each family is pitch perfect, but wrapping that tension up strains plausibility. Yet it’s a good ride and a well-executed vision. This entry was posted in Drama and tagged 2012, African-American, April, Boston, Class, Curtis McClarin, Francesca Choy-Kee, Huntington Theatre, Irish American, James Noone, Kirsten Greenidge, MA, March, Marianna Bassham, May, McCaleb Burnett, Melia Bensussen, Nikkole Salter, Race, Shalita Grant, The Luck of the Irish, Victor Williams by gilliandaniels. Bookmark the permalink.